After all festive food and work, it took little time for me to come back to routine. 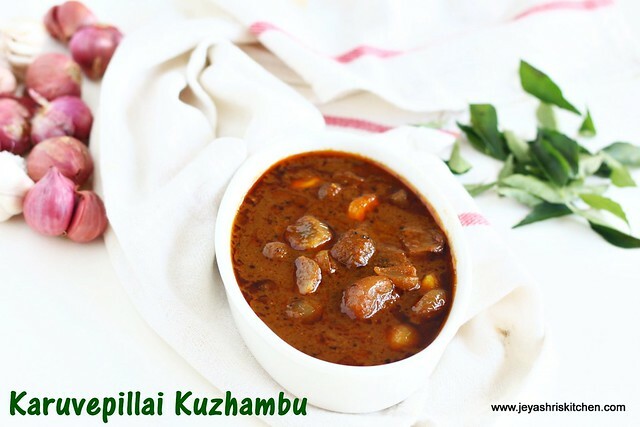 So today i will be sharing the recipe of Chettinad style Karuveppillai Kuzhambu| Curry leaves kulambu. This authentic South Indian gravy recipe, was passed to me by a reader Ceyizhai Pari, sometime back. so i thought i will try it and post this today. So after the festive food this simple karuveppillai kuzhambu with hot rice and beans curry was totally a bliss for me. 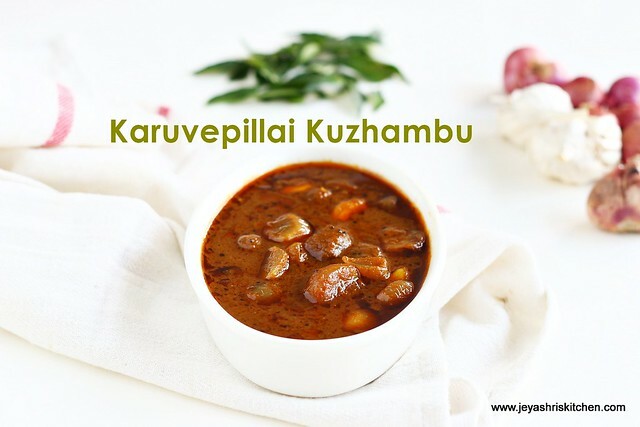 Check out my other version of karuvepillai kuzhambu too which i posted long back. Soak lemon sized tamarind in hot water and take out 2 cups of extract from that. Peel the skin of the onions and garlic. In a pan add oil and add the mustard seeds, black pepper and methi seeds. When the mustard seeds splutter, add the onions and garlic. Let this cook in a medium flame till it becomes nice golden brown colour. Grind the curry leaves, tomato, sambar powder, fennel powder and coriander powder into a fine paste. Add little water to this while grinding if needed. Once the onions and garlic are done add the ground paste to this. Mix this well and add 1/2 cup of water. Cook in a low flame till the raw smell goes. It will take around 10 minutes. Stir in between. Now add the tamarind extract. Add turmeric powder and salt to this. Let this boil in a medium low flame till it reaches a kuzhambu consistency and the oil floats on the top. Add the jaggery and mix well. Switch off the flame. Serve hot with any curry of your choice or a simple papad| appalam will be perfect too. 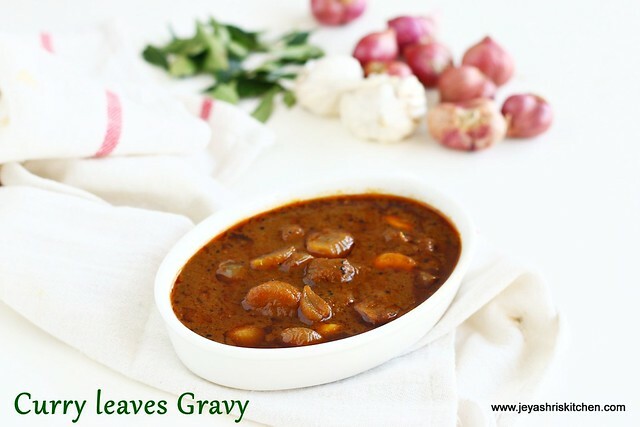 Shallots make this gravy very perfect, but if you can't find it in your place or lazy to peel it, go ahead with finely chopped big onions. You can add 1 tsp of red chilli powder to this gravy if you need it very spicy. what a tempting clicks Jey.. I love this version looks yum! I made this kuzhambu for lunch and it came out very well. Instead of adding whole pepper, I added pepper powder after adding the ground paste. What do we do with the vendayam? made this kuzhambu today...came out very well.tasted too good.